Thank you to all who have registered for Valentine’s Date Night! We have reached full capacity. Now is a good time to mark your calendars, book a sitter, and plan what to wear! 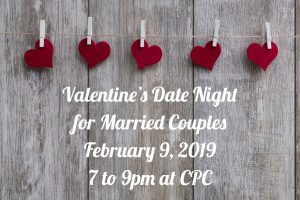 We look forward a fun evening together on Saturday, February 9 from 7 to 9PM in the CPC Community Room! We still need volunteers! Register here to volunteer.